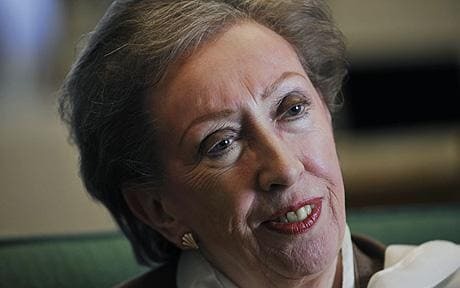 Margaret Beckett, a former senior minister sacked by Gordon Brown who is now standing to become the next Speaker of the House of Commons, has refused to express backing for the Prime Minister. The Derby South MP, who was criticised during the expenses scandal for trying to claim £600 for hanging baskets, acknowledged that reform was needed to MPs allowances, but warned that it would be easy to get wrong. Source: Daily Telegraph report by Melissa Kite, Deputy Political Editor, 9:00PM BST 13 Jun 2009. Note, the above report tells us that Margaret Beckett, when pressed to say more about Gordon Brown's management style, conceded: "We have always worked together, we haven't always seen eye to eye." She added: "I don't want to hurt his feelings, because God knows everyone is giving him such a kicking at the moment, but it is a matter of public record that I'm probably unique in being sacked twice by Gordon." Doesn't want to hurt Gordon Brown's feelings eh? I don't recall her being concerned about Tony Blair's feelings when he was relentlessly attacked, undermind and backstabbed by Gordon Brown for years on end. Going by the above report Ms Beckett seems unable to give straight answers. Trying to charge taxpayers £600 for her hanging baskets speaks volumes. I say, no more dodgy characters in Westminster, vote for Widdy as Speaker.